Superficial – associated with movements of the shoulder. Intermediate – associated with movements of the thoracic cage. Deep – associated with movements of the vertebral column. The deep muscles develop embryologically in the back, and are thus described as intrinsic muscles. The superficial and intermediate muscles do not develop in the back, and are classified as extrinsic muscles. This article is about the anatomy of the deep (intrinsic) back muscles – their attachments, innervations and functions. The deep muscles of the back are well-developed, and collectively extend from the sacrum to the base of the skull. They are associated with the movements of the vertebral column, and the control of posture. The muscles themselves are covered by deep fascia, which plays a key role in their organisation. Anatomically, the deep back muscles can be divided into three layers; superficial, intermediate and deep. We shall now look at each layer in more detail. The superficial muscles are also known as the spinotransversales. There are two muscles in this group – splenius capitis and splenius cervicis. They are both associated with movements of the head and neck. They are located on the posterolateral aspect of the neck, covering the deeper neck muscles. Attachments: Originates from the lower aspect of the ligamentum nuchae, and the spinous processes of C7 – T3/4 vertebrae. The fibres ascend, attaching to the mastoid process and the occipital bone of the skull. Innervation: Posterior rami of spinal nerves C3 and C4. Attachments: Originates from the spinous processes of T3-T6 vertebae. The fibres ascend, attaching to the transverse processes of C1-3/4. Innervation: Posterior rami of the lower cervical spinal nerves. 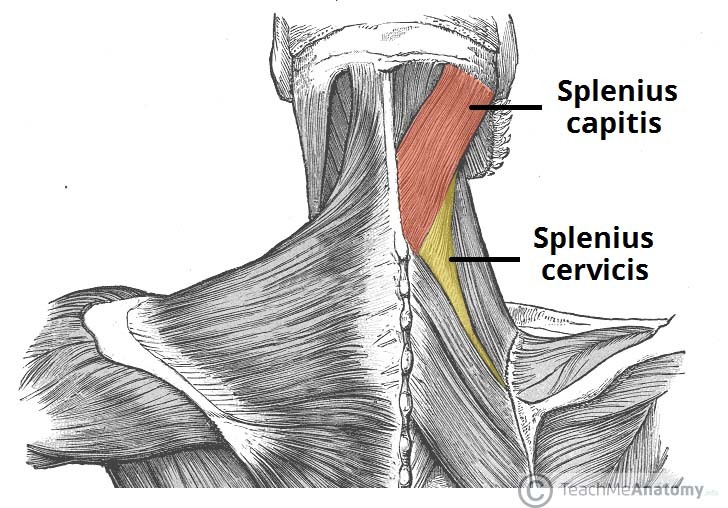 Note: The two splenius muscles can also act together to extend the head and neck. Fig 1.0 – The splenius muscles, located with the superficial layer of intrinsic back muscles. 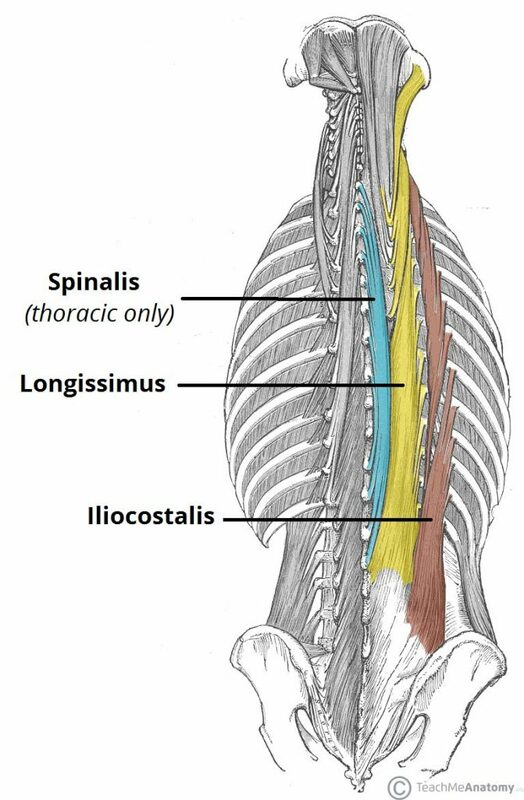 There are three intermediate intrinsic back muscles – the iliocostalis, longissimus and spinalis. Together these muscles form a column, known as the erector spinae. The erector spinae is situated posterolaterally to spinal column, between the vertebral spinous processes and the costal angle of the ribs. Lumbar and lower thoracic vertebrae. Posterior aspect of iliac crest. Fig 1.1 – The erector spinae. The iliocostalis muscle is located laterally within the erector spinae. It is associated with the ribs, and can be divided into three parts – lumborum, thoracis, and cervicis. Attachments: Arises from the common tendinous origin, and attaches to the costal angle of the ribs and the cervical transverse processes. Innervation: Posterior rami of the spinal nerves. Actions: Acts unilaterally to laterally flex the vertebral column. Acts bilaterally to extend the vertebral column and head. The longissimus muscle is situated between the iliocostalis and spinalis. It is the largest of the three columns. It can be divided into three parts – thoracic, cervicis and capitis. Attachments: Arises from the common tendinous origin, and attaches to the lower ribs, the transverse processes of C2 – T12, and the mastoid process of the skull. The spinalis muscle is located medially within the erector spinae. It is the smallest of the three muscle columns. It can be divided into the thoracic, cervicis and capitis (although the cervicis part is absent in some individuals). Attachments: Arises from the common tendinous origin, and attaches to the spinous processes of C2, T1-T8 and the occipital bone of the skull. The deep intrinsic muscles are located underneath the erector spinae, and are known collectively as the transversospinales. They are a group of short muscles, associated with the transverse and spinous processes of the vertebral column. There are three major muscles in this group – the semispinalis, multifidus and rotatores. Fig 1.2 – The semispinalis and multfidus muscles. The semispinalis is the most superficial of the deep intrinsic muscles. Much like the intermediate muscles, it can be divided by its superior attachments into thoracic, cervicis and capitis. Attachments: Originates from the transverse processes of C4-T10. The fibres ascend 4-6 vertebral segments, attaching to the spinous processes of C2-T4, and to the occipital bone of the skull. Actions: Extends and contralaterally rotates the head and vertebral column. 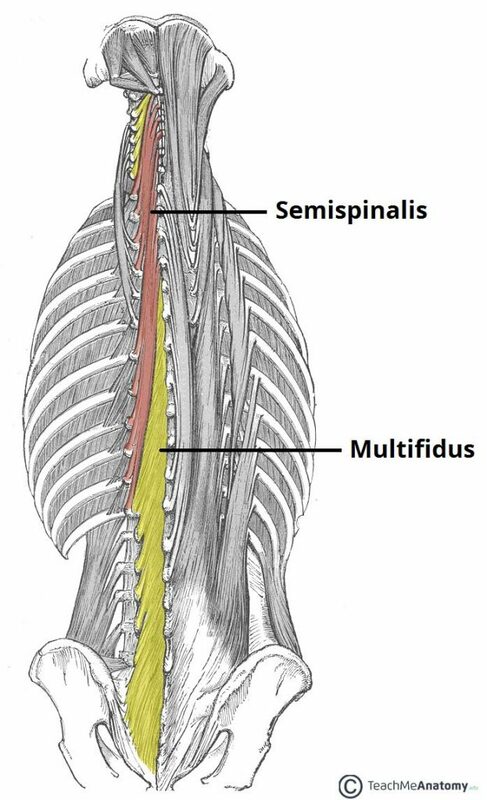 The multifidus is located underneath the semispinalis muscle. It is best developed in the lumbar area. Attachments: Has a broad origin – arises from the sacrum, posterior iliac spine, common tendinous origin of the erector spinae, mamillary processes of lumbar vertebrae, transverse processes of T1-T3 and articular processes of C4-C7. The fibres ascend 2-4 vertebral segments, attaching the spinous processes of the vertebrae. Actions: Stablises the vertebral column. Attachments: Originates from the vertebral transverse processes. The fibres ascend, and attach to the lamina and spinous processes of the immediately superior vertebrae. Actions: Stablises the vertebral column, and has a proprioceptive function. Interspinales: Spans between adjacent spinous processes. Acts to stablise the vertebral column. Intertranversari – Spans between adjacent transverse processes. Acts to stablise the vertebral column. Levatores costarum – Originates from the transverse processes of C7-T11, and attaches to the rib immediately below. Acts to elevate the ribs. What is the function of the splenius capitis? Which of these Spinalis, Iliocostalis and Longissimus lies most laterally? 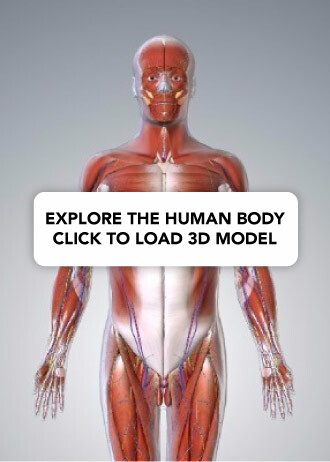 Which of these muscles is not part of the deep group of intrinsic muscles?